The Commissary man — he happened to be in our mess, never had any sugar over, any salt, any soda, any coffee — oh no! But beg him, plead with him, bear with him when he says, ‘Go way, boy! Am I the commissary general? Have I got all the sugar in the Confederacy? Don’t you know rations are short now?’ Then see him relax. ‘Come here, my son, untie that bag there, and look in that old jacket and you will find another bag — a little bag — and look in there and you will find some sugar.’ ‘Now go round and tell everybody in camp, won’t you. Tell ‘em all to come and get some sugar. Oh! I know you won’t. Oh yes! of course.’ Harper’s Weekly, April 18, 1863 Southern Historical Society Papers. Vol. I. Richmond, Virginia., February, 1876. No. 2 Camp Fires Of The Boys In Gray. In February, 1862, John F. Whitfield, Esq., obtained the authority to recruit one of the three companies necessary to complete the reorganization of the First Alabama Regiment, C. S. A., serving at that time as heavy artillery at Pensacola, Fla. Meeting with Merrill E. Pratt, Esq., of Prattville, he proposed to that gentleman to raise one half the company, he himself expecting to bring thirty or forty men into the field. Mr. Pratt was thinking, at this time, of joining another regiment with a small squad of men, who desired to be with him in the army, but, seeing now a wider field for usefulness, he accepted the proposal. In a few days, through his personal influence and popularity, he enrolled the names of nearly fifty volunteers, including some of the best men in Autauga county, and, had he not been restricted by the terms of his agreement with Capt. Whitfield, he could, without difficulty, have recruited a full company. On the 7th of March, Lieut. Pratt and his men proceeded to Montgomery, and, on the following day, were mustered into the service of the Confederacy, styling themselves, in honor of the Governor of the State, the “John Gill Shorter Artillery.” John F. Whitfield was elected Captain; M. E. Pratt, First Lieutenant; Dixon S. Hall, Second Lieutenant, Jr.; and Charles E. Tuttle, Orderly Sergeant. The second lieutenancy was left vacant, to be filled by the squad of men Capt. Whitfield still expected to secure. For the failure of these men to report, Capt. Whitfield was in no manner responsible, he acting throughout in good faith. No officer had more the confidence and affection of his men than Capt. Whitfield, and this esteem he retained from first to last. While in Montgomery, enameled cloth knapsacks and haversacks, and cedar canteens, were issued to the men, but they provided their own uniforms, no two of which were alike. When enrolled the men expected to go to Pensacola, but upon arriving in Montgomery, it was learned that the regiment had left that place for New Madrid, Mo., a fortified post on the Mississippi River. As this change in destination, from a warm to a cold climate, and from garrison to field duty, necessitated a change in clothing, leave of absence for two days was given the members of the company to return home and make needed preparations. There was a general cutting down in the amount of impedimenta, though most of the men loaded themselves with twice the amount that could be carried on a march. On the morning of March 10th, the company reassembled in Montgomery, and, under the command of Lieut. Hall, started for Memphis. Monday night they camped at Atlanta, not being able to proceed farther on account of the crowded trains. It was not till Wednesday noon that the company reached Memphis. The regiment was just leaving the city by the boat, and could not wait for the company to join ; Lieut. 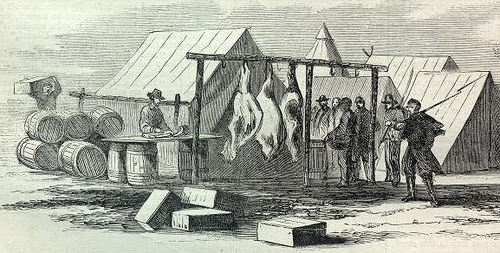 Hall, however, reported, and received orders to proceed by the steamer “ Republic,” which left the next day at 5 p. m.
Approximately two years after Daniel’s account of the 1st Alabama, The Fort Pillow Massacre occurred in Tennessee. On April 12, 1864, more than 300 African-American soldiers were killed. It was one of the most controversial events of the American Civil War (1861-65). Though most of the Union garrison surrendered, and thus should have been taken as prisoners of war, the soldiers were killed. The Confederate refusal to treat these troops as traditional prisoners of war infuriated the North, and led to the Union’s refusal to participate in prisoner exchanges. Thursday night the boat reached Fort Pillow, where it was learned that New Madrid had been evacuated, and that the First Alabama had been ordered to Island No. 10. 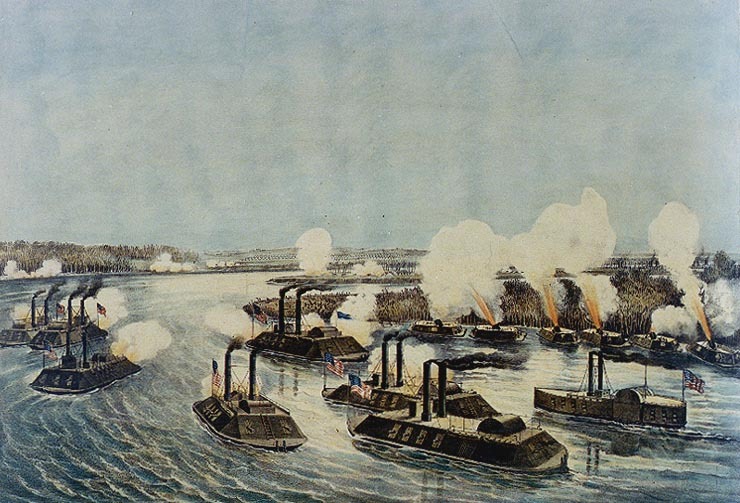 Bombardment and Capture of Island Number Ten on the Mississippi River, April 7, 1862 Colored lithograph published by Currier & Ives, New York, circa 1862. It depicts the bombardment of the Confederate fortifications on Island Number Ten by Federal gunboats and mortar boats. Ships seen include (from left to right): Mound City, Louisville, USS Pittsburg, Carondelet, Flagship Benton, Cincinnati, Saint Louis and Conestoga (timberclad). Mortar boats are firing from along the river bank. Friday evening the “ Republic ” arrived at Tiptonville, and the men disembarked; but, the boat being detained, they slept on board that night. Saturday they again landed, and marched across from Tiptonville to Island No. 10, a distance of six miles. 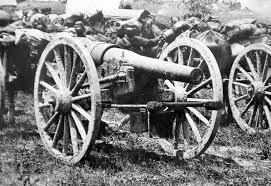 The regiment was found encamped without tents in a newly-cleared field, and the company, thus early in its service, began roughing it. It was not till the 18th that they received any tents; they then were moved into a wood, some three-quarters of a mile from the river. On the 25th the camp was again moved, and tents pitched in regulation order in an open field in the rear of Batteries Nos. 5 and 6; a camp guard was detailed, and the military routine of guard-mounting, drill and dress-parade began. Capt. Whitfield and Lieut. Pratt arrived on the 18th, receiving a hearty welcome. There now being no hope of the other squad reporting, it was decided that Lieut. Pratt should return home and recruit the company to its full strength. Total, 4 commissioned officers, 9 non-commissioned officers and 39 privates. During the Civil War, Confederate and Union soldiers woke up, ate, marched, and went to bed to the sounds of fifes and drums. Each company was supposed to include two field musicians, usually a drummer and a fifer. Despite the popular image of the “little drummer boy,” most field musicians were no younger than other soldiers. Service records for musicians show ages ranging from 16 to 65. W. H. Hutchinson was soon after detailed as a member of the drum corps, and O. M. Blaylock was appointed corporal in his stead. Joseph Hurd was detailed at the same time as fifer. All the above were present for duty, except Private Griffin, who received a furlough when he enlisted, and reported to Capt. Isbell after the surrender of the Island. Muskets were not issued to Co. K for two weeks after their arrival, but details for fatigue and guard duty were made after a few days. When Capt. Rucker’s company was relieved at Battery No. 1, on the third or fourth day of the siege, a detail of sixty men from the First Alabama was ordered there, with daily relief. Co. K furnished four or five men of this detail. The men were quickly initiated into the mysteries of the cuisine, and from the first day some were quite good cooks, while others made most amusing blunders. A camp-kettle, half full of rice, was a source of much worry to an amateur who attempted to boil it—there were not enough utensils in the company to hold South Carolina’s favorite dish as it swelled in the pot. On the 30th of March, Lieut. Pratt and Corp. Ellis left for Alabama to enlist recruits. About the same time Privates M. A. Smith and J. L. Robinson were honorably discharged on account of physical disability, and left for their homes.